Teaching your kids good oral hygiene is a critical part of their overall dental health. However, a topic that is also important is protecting children’s teeth with mouthguards. An often overlooked piece of equipment, and surprisingly not consistently required for children playing sports, mouthguards protect children’s teeth from damage, and parents should be aware of their many benefits. If your child is active in sports or other very physical activities, they may have an increased risk of traumatic injury to the mouth. 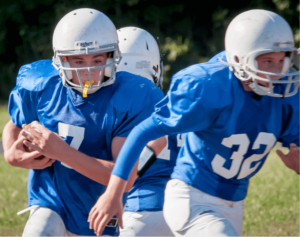 While many adults are very aware of other protective gear kids are required to wear for certain athletic activities, they often overlook mouthguards. Trauma is extremely common for kids, especially preteens and teens who play baseball, basketball, volleyball, etc. because mouthguards aren’t required for those sports. Mouthguards are designed to effectively absorb the shock of a sudden impact that a child might receive while playing sports. It can prevent not only damage to tooth enamel (chipped teeth, cracked front teeth, etc.) but also other potential injuries caused by impact such as jaw fractures, damage to lips, gums, and cheeks. It also protects the jaw joint itself. Mouthguards designed for children in sports are commonly called an athletic mouthguards. However, this can cause some confusion with parents who feel that only kids playing a direct contact sport such as football need to wear a mouthguard. Not true! Almost any sport a child can play involves running, skipping, jumping or tumbling; any of these can cause a sudden impact to the mouth. While it may not be realistic to have a child use a mouthguard any time they do an activity, make sure they wear one for any organized physical activity. There are actually several kinds of mouth guards, from off the shelf models to custom fit mouthguards. Off the shelf mouthguards, though somewhat useful, are not designed to fit your child’s unique set of teeth. If possible, invest in a more custom option that is somewhat fitted to your child’s teeth. If you’re unsure which style of mouthguard is best for your child, consult a board certified pediatric dentist so they can present options that will work for your child. I love the SiSu mouthguard because you can remold them many times over as your child grows and loses baby teeth, as well as use it as night guard if your child is grinding at night (www.sisuguard.com). Mouthguards in sports really are a necessary piece of protective equipment. Dental injuries are the most common type of orofacial injury sustained during children’s sports participation. According to the American Academy of Pediatric Dentistry, a AAO survey found that 84 percent of children do not wear mouthguards while playing organized sports because they are not required to wear them, even though they may be required to wear other protective materials, such as helmets and shoulder pads. Not only do mouth guards save teeth, they help protect jaws. Children wearing braces have slightly higher risk of oral injuries, including mouth lacerations, if their braces are hit by a ball or another player. The American Dental Association recommends that anyone who participates in a sport that carries a significant risk of mouth injury wear a mouth protector. Rinse the mouthguard before and after each use or brush it with a toothbrush and toothpaste. Occasionally clean the mouthguard with cool, soapy water and rinse it thoroughly. Do not leave the mouthguard in the sun or in hot water. Transport and store the mouthguard in a sturdy container with vents. Check the mouthguard for wear and replace it when the guard becomes distorted. Still have questions about mouth guards? Make an appointment with your pediatric dentist to discuss your options.